Please welcome guest blogger Tabitha Strepthorne. For our perusal, she has an informative article about letting your rabbit roam in your backyard. While exploring your backyard and garden can be a great source of fun and exercise, there are opportunities for your rabbit to get into harm’s way. She has some helpful tips and advice you can use to make sure your furry friend stays safe while still having a great time. If you have any questions, comments or your own ideas for bunny fun, please let Tabitha and us know in the comments section below. Have a great weekend! Whether you have a Netherland dwarf or an English Giant it is important to make sure that your pet rabbit gets the exercise he or she needs. Large, spacious hutches are great for keeping your rabbit in shape, and there are outside hutches available for sunny days. There are even rabbit harnesses that you can put onto the rabbit so that you can take your bunny for walks! However from personal experience, some bunnies may not like the feel of the harness and they will chew through it. Often outside hutches can seem cramped. So what to do? Why not make the entire garden your bunny’s exercise yard? If you have a colourful, green garden with a few nice patches of grass, it may be worth looking into bunny-proofing your garden. Unfortunately if you have a pond, chances are no amount of ‘bunny proofing’ will make it safe for your rabbit to run around the garden. Bunnies are a lot like babies. If you take your eyes off them for a minute, somehow they will find their way into the strangest cubby holes, nooks and crannies. This is why it is important to ensure that any fences are fully staked into the ground, and that any gates have a rubber lining or a low hanging base to make sure that the rabbit doesn’t crawl underneath the gate and get out of the garden. If you have decking it is important to board up any entrances to the decking, as if your bunny is at all adventurous they will try to find a way underneath. Beneath the decking is a great place for rabbits as it is dark and shady – perfect for the summer! 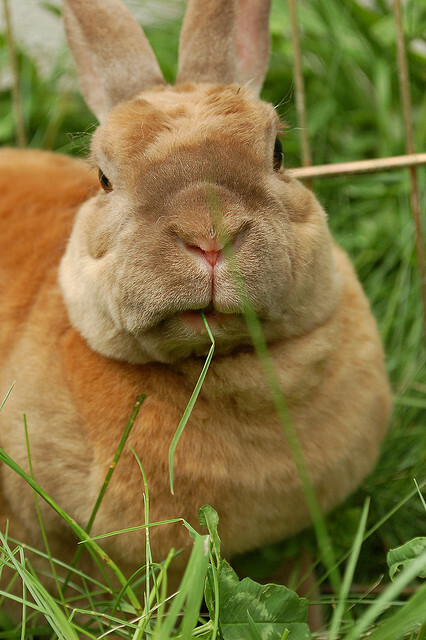 Most rabbits have an innate sense of danger and will be able to sniff out any potentially harmful plants. However rabbits have strong taste buds and can be curious, particularly young rabbits, so on occasion things can take a turn for the worse. Certain plants are incredibly harmful to rabbits, so it is important to look these up online to make sure that your bunny is safe. A few examples of common plants that can be poisonous to rabbits are oak leaves, poppies and buttercups although a little bit of digging online will harbour a more complete list of poisonous plants. Bunnies can get nervous too! If you have a small garden and a young bunny, try placing some of its bedding in a corner of the garden. The bunny will gravitate towards the bedding as a source of familiarity and comfort, and as it gets more used to the feel of the garden the rabbit will then start exploring more and more of the garden. The most important thing is ensuring that your bunny feels safe and secure while running around the garden. Make sure to put a bowl of water out for your bunny in a shaded area as they will become dehydrated. Weigh the bowl down with a few stones so that your bunny doesn’t knock the water over by running past it or jumping over it. It is important to remember that nothing is foolproof! Although your bunny will be able to run and play it is crucial that you supervise them to ensure that you can take any action needed if your bunny starts getting into trouble or starts acting out. Like a small child, stay close to your bunny and be aware! 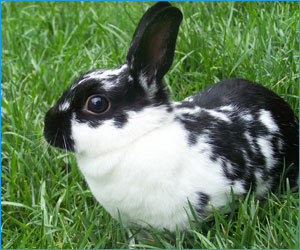 With a safely bunny-proofed garden your rabbit can hop and run around to their hearts content! 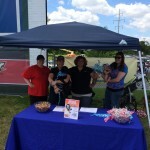 This past Sunday the Lancaster Barnstormer’s held their annual Bark in the Park event at the Clipper Magazine Stadium. 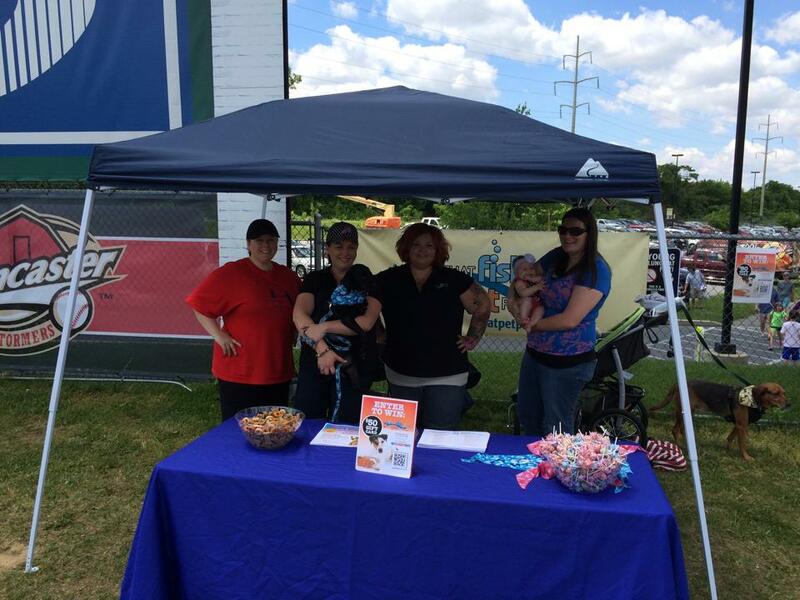 That Pet Place mascots, Bernie the St. Bernard and Chompers the shark, were in attendance, and That Pet Place had several reps in the lawn area with all of the pets and other vendors. 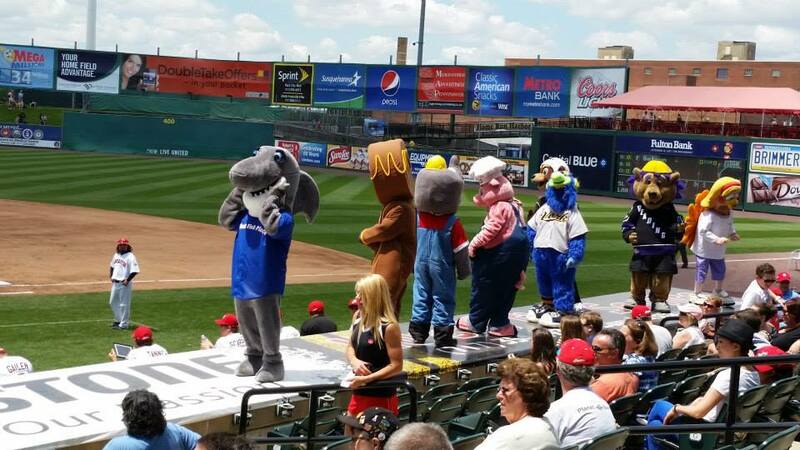 The afternoon started with a yappy hour in the front of the stadium with $1 hot dogs. 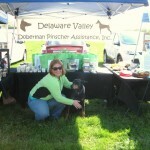 All proceeds from the sale of the food and the special lawn tickets went to the Lancaster SPCA and supports a great cause to our local community. 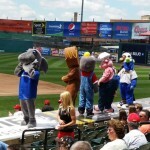 The Barnstormer’s also had several other events going on that day: a walk for kids with diabetes & it was their mascot, Cylo’s, birthday! 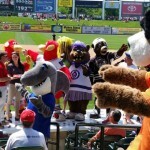 There were tons of mascots in attendance, including the Turkey Hill Turkey and the Hershey Bear’s mascot! 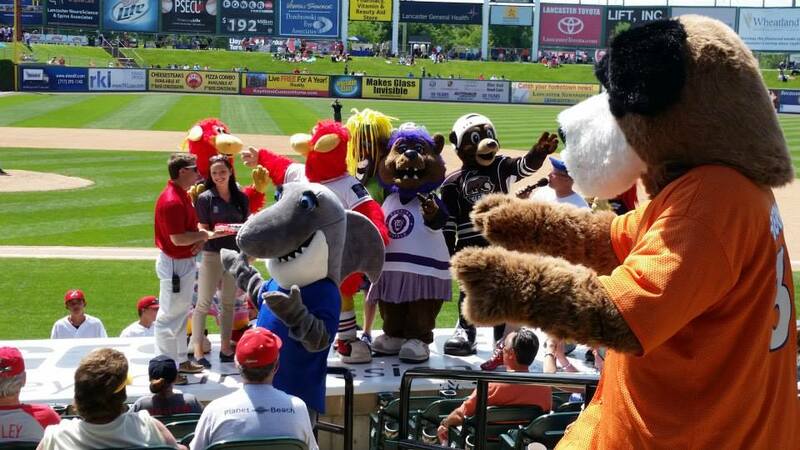 Bernie and Chompers were honored to be a part of the celebration. 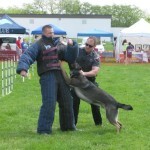 Back in the lawn area, the reps from TPP (including myself) were swarmed with fans and their friendly dogs. Everyone had a great time mingling and socializing with each other. 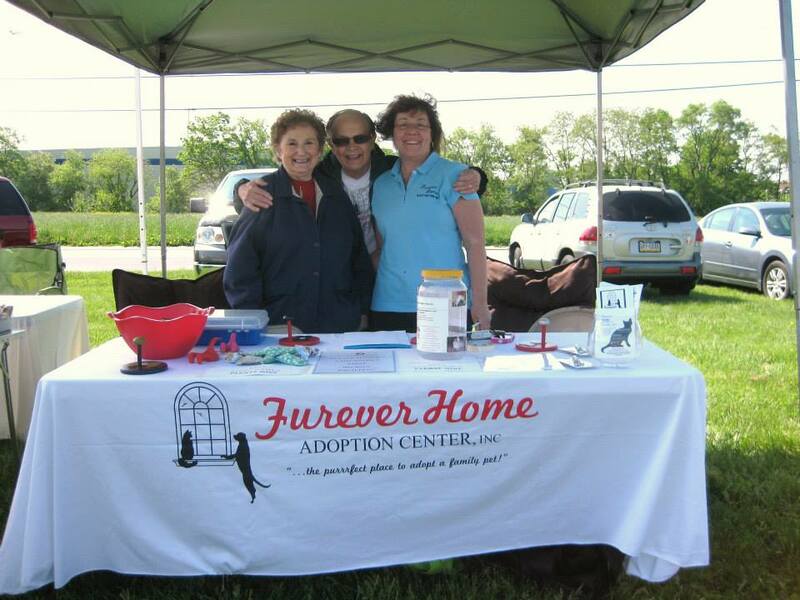 Tina from Furever Homes Adoption joined us as well (they’re a proud member of Lancaster CARES) to promote their upcoming craft and vendor fair on That Pet Place grounds on July 12th, 2014. 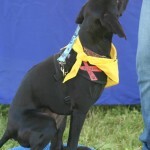 TPP had a camouflage bandanas for the dogs in attendance. If you missed the event, stop by the store. We have a few left over and they’re for sale in the retail store in Lancaster, PA! Did you go to the game? Snap any pictures? Please, share them with us on our Facebook page! If you weren’t able to make the game, make sure you keep an eye out this fall; the Lancaster Barnstormer’s are planning another event for this fall! Watch our Facebook page in the coming months as we figure out the details! 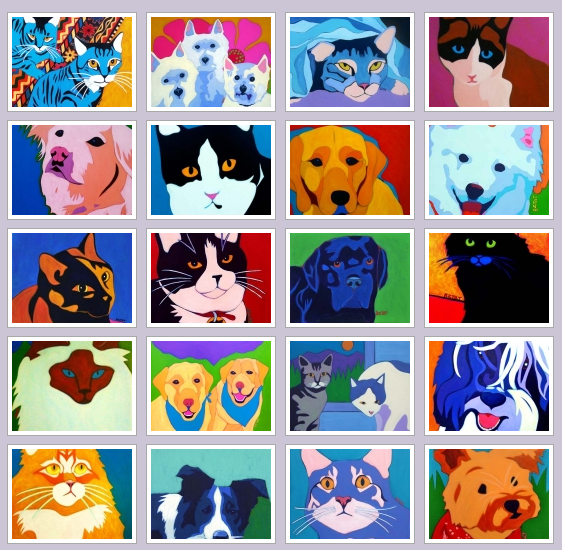 As a follow up from my post on low cost DIY pet portaits, I had the opportunity to meet with the artist behind Bztat Studios at the 2014 BlogPaws Conference in Lake Las Vegas. I even won a free digital pet portrait at the conference! 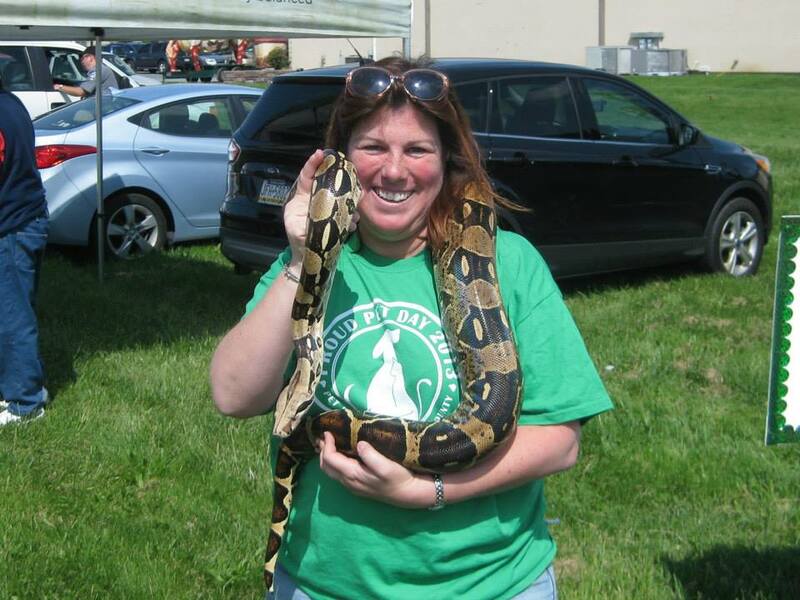 Hi That Pet Place readers – If you’re local to the Lancaster, PA area I hope you had a chance on Saturday to stop out at the 2nd annual Pet Pantry Proud Pet Day for some fun and games! I want to thank all of the organizations, volunteers, and customers for making this event such a huge success this year! We had beautiful (although a little bit chilly) weather and a great crowd to meet with. Cylo from the Lancaster Barnstormers stopped by to promote their upcoming Bark in the Park event (a day where you can take your dog with you to the baseball game) and was a huge hit with the kids and the dogs! Forgotten Friends was taking snake photos, The Feathered Sanctuary had lots of rescue birds out who were available for adoption, and all kinds of rescue organizations from around the area stopped by to promote pet welfare and adoption. 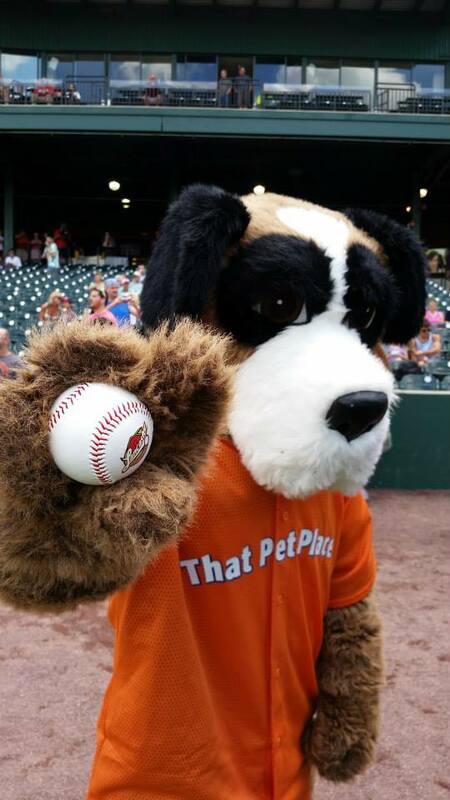 Thanks to all of our customers who donated to the Stuff the Truck event & helped feed pets in need; the 50/50 raised about $500 and Beau, last year’s winner of the Beneful Dream Dog Park chose the winning tennis ball towards the end of the day. Local artist Neil was doing Pet Caricatures and Pet Psychic Cynthia was doing readings… all for this great cause for our local area! I can’t even begin to thank everyone enough for all the support they showed. Another big thank you goes out to the vendors who took the time to set up a table or booth at the event and hand out samples to customers. 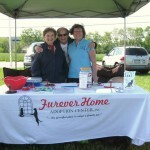 I was in attendance as a representative of the organization Tripawds, who is very near to my heart. 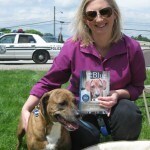 My very own Tripawd, Barret, was there and of course was the star of the show. 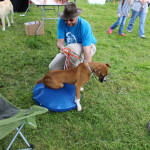 He was busy showing off his balance skills on the FitPaws Balance Disk to anyone who might give him a treat (which he got many of since we were stationed next to a treat station from Bradley Caldwell!). Pet Cancer and limb amputation isn’t something a lot of people want to talk about openly, but I had a lot of people who were surprised he was able to get along so well with 3 legs. I just kept repeating that he was “born with 3 legs and a spare”! 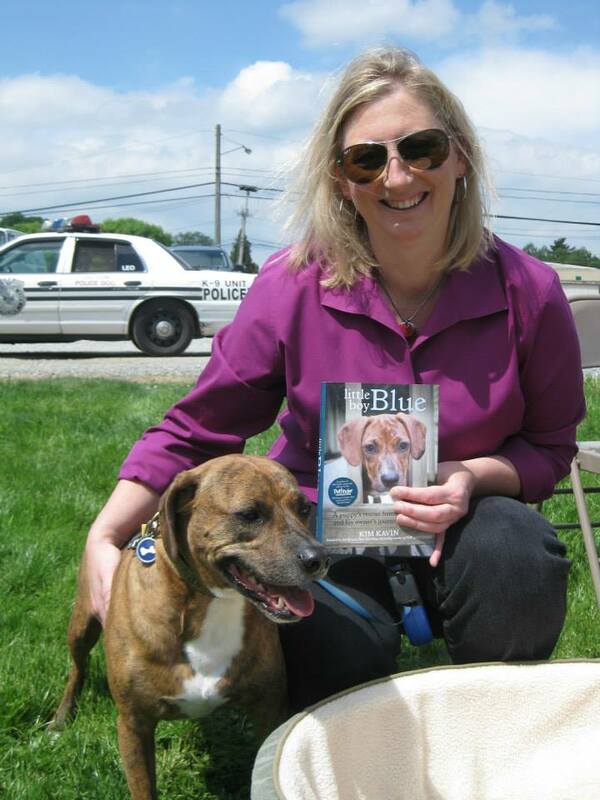 I hope that I was able to dispel some common myths and rumors about canine cancer and provide a future resource to anyone who may face this tragic disease in their pets’ futures. 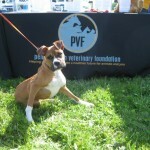 We were also stationed next to Chance, the Boxer who had an untreated leg injury as a pup which left him unable to walk (from Last Chance Animal Rescue). Chance recently had surgery to fix his injury and is now learning how to walk for the first time. I was able to talk with Dr. Bryan from The Pet Pantry and Chance was able to to try out the FitPaws Balance Disk which might help him recover if used for physical therapy and training to rebuild the muscles he hasn’t ever had a chance to use! The question I had to answer most (other than explaining Barret wasn’t a lab puppy, but a 6 year old cocker spaniel mutt) was that he was most certainly NOT up for adoption! This little boy has a home, but anyone looking for a pet, whether they are “specially abled” or not, should check with their local rescues and PetFinder.com before going to a breeder or anywhere else. Stay tuned, Pet Place friends and family, we’ve got even more adoption and pet welfare events planned throughout the year! Did you attend the festivities? What did you think? Did you have a favorite booth or activity? Let us know what you thought so we can improve the event for future years! 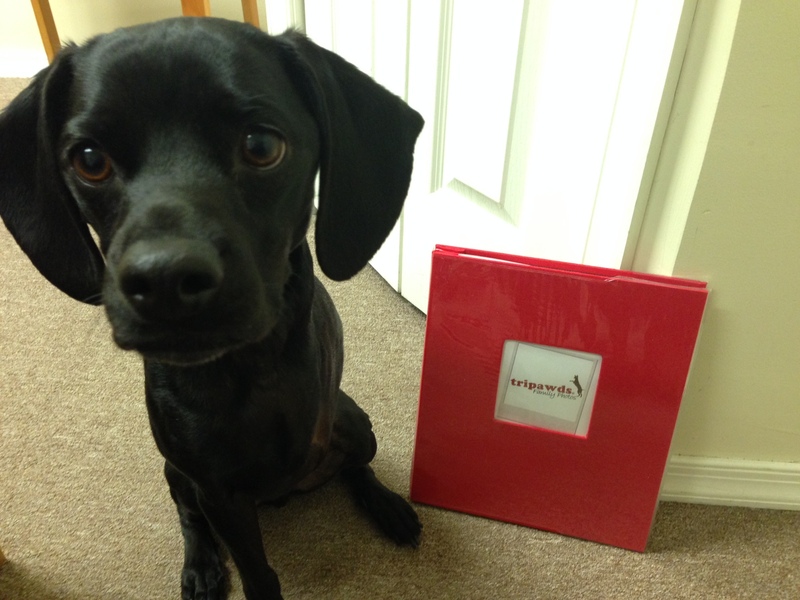 Hi Pet Blog readers and bloggers! 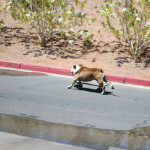 If any of you attended BlogPaws in Las Vegas, you’ll know I’m not lying when I tell you we had a BLAST! 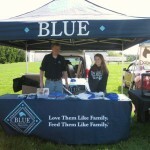 It was a fun, pet-friendly event that was just perfect for That Fish Place – That Pet Place to attend. I couldn’t have asked for more. I met with tons of passionate pet bloggers who have a ton of followers and they’re all looking for the best products for their pets. We’re only happy to oblige 🙂 Bonus! I finally got to meet the founders of Tripawds, who were my personal saviors when Barret was going through his cancer diagnosis and surgery. I don’t think it would have been possible for them to be cooler people to spend the week with! I am more passionate than ever about furthering their cause. 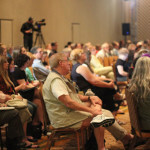 The seminars were fantastic resources for bloggers looking to gain an edge, a following and to perfect their art. The dinners and events were fun filled and fantastic opportunities to talk with everyone about their products, pets and passions. The expo hall was filled with great products to try at home and blog about (or even bring in to the store for our customers to try, too). I was amazed by some of the pets that bloggers brought with them. 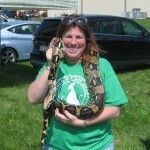 There were dogs of all sizes, of course, cats, birds, ferrets, rats, even a Capybara! And everyone was dressed to the nines for the red carpet on Saturday night. 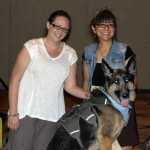 The absolute best part was seeing all the donations that the BlogPaws teams presented during the ceremonies; everything from cash donations to armor for Nevada police dog units. If you’re a pet blogger or have a following on your social media page, I highly suggest you purchase tickets to next year’s event in Nashville. You won’t be sorry you did and hopefully you’ll see us there, too! Did you go to BlogPaws? What did you think? Share with us in the comments! As I type this, I’m currently en-route to BlogPaws – the biggest [and best, as far as I am aware] pet blogging and social media conference in the US. 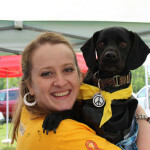 I could not be more excited to meet more pet bloggers and community members as dedicated to providing fellow pet owners with valuable information to keep their pets safe, healthy & happy! I’ll be blogging from the event as often as time allows, so stay tuned. In the meantime, if there are any aspiring pet bloggers out there looking for a chance to contribute – don’t forget that That Pet Blog accepts guest blog posts, check out our general guidelines here), and we’ve just introduced a partnership opportunity for more established bloggers who wish to write product reviews on their blogs (or guest post on ours). Take a minute to fill out our entry form for consideration in this program. 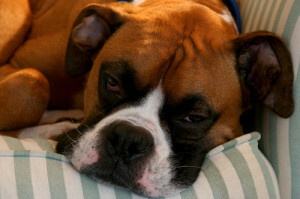 So, how did I even hear about BlogPaws? Well, I heard of it a few years back and I remembered hearing about the conference just after last year’s event, but didn’t really dive into the community until a good friend of mine from Tripawds was looking for a sponsor to attend and suggested that it would be a good opportunity for That Pet Place to attend as well. And here we are! I’m attending Blog Paws for the first time and That Pet Place is proud to sponsor Tripawds trip and watch them present at the conference! 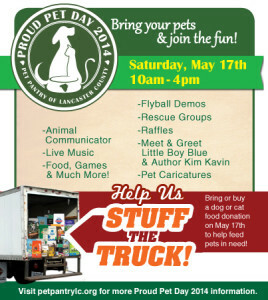 Speaking of Tripawds, At the retail store next weekend (May 17, 2014) we’re celebrating the 2nd Annual Proud Pet Day! 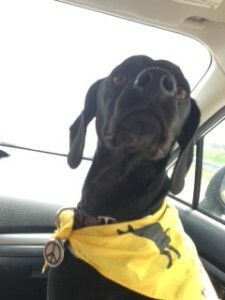 I’ll be back in time to attend the event as an official Tripawds representative, with Barret of course! 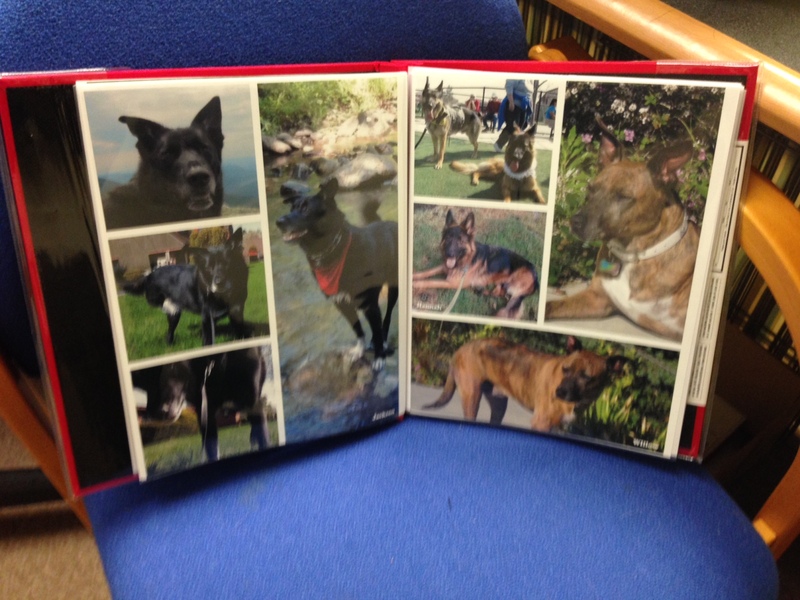 Pages can be added at any time and it will travel with the Tribute leash and banner to events or wherever its requested. I hope that everyone enjoys looking at the photos as much as I enjoyed creating it. So, if you’re heading to Las Vegas for Blog Paws 2014 – keep an eye open for me, Heather Crotsley, from That Pet Place and introduce yourself! **Update: I’ve already met 2 great bloggers and the event hasn’t started yet! Jamie from Thoughts Fur Paws and Christine from Oh My Shih Tzu were so welcoming and had lots of great tips and got my brain working! If you’re anything like me, you’ve seen those ads on Etsy or Pinterest where you can purchase a painting of your pet for hundreds of dollars. You may have even been tempted, like I have been, to buy one or check further into it, only to be deterred by the cost of the artist’s work. As an artist myself, I know that their time is valuable and their work is worth it if you have the money to spare. Many of us don’t have that kind of cash lying around for a treasured piece of art. If you’re a little cash strapped and you’re looking for an inexpensive alternative for some custom pet artwork, either as a gift or for décor for your own home, look no further. This is the blog post you’re looking for! I have 3 low-cost options that every pet-enthusiast will love! 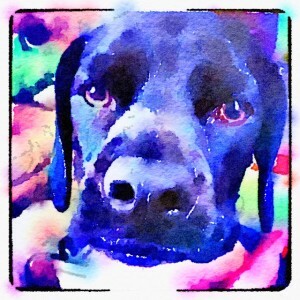 This is my favorite app for watercolor dog paintings and cat paintings. It produces high quality watercolor-like images that you can save and email to yourself, then print at an enlarged size without losing the quality. I’ve used this app for framed pictures of my dog paintings, screensavers of my dogs, photo collages, and even custom greeting cards. At $2.99 you’ll be shocked at how much use you can get out of this app. It’s currently only available on iTunes for iPhone or iPad. 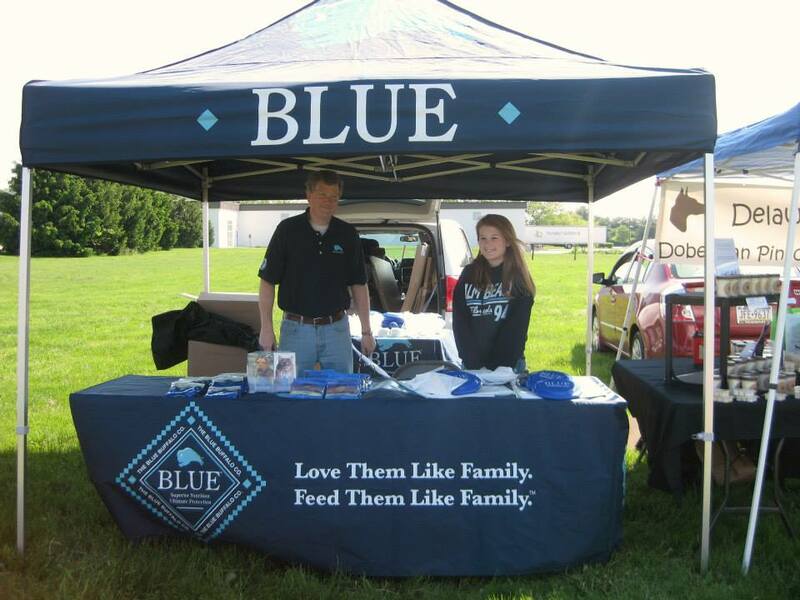 This past weekend Barret and I visited the American Cancer Society’s Bark for Life in Hummelstown. He had such a great time meeting new people and other dogs! He was such a good boy! Part of our visit was to see how he is going to do when he is an ambassador for Tripawds at The Pet Pantry’s Proud Pet Day on May 17th, 2014 at That Fish Place – That Pet Place. He’s going to be a delight! The only embarrassing thing he did was swim in the baby pool intended as a water dish for the other dogs. Oops! One of the booths we stopped at had a local Pet Communicator or Psychic, Cynthia, doing readings. I thought, what the heck! Why not? 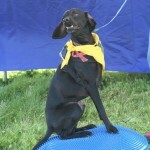 I thought I’d share my experience with you and I’d love to hear if any of you have ever spoken with a pet communicator. If you have, leave a comment and let me know what you took away from the experience. The first thing she said to me when I sat down with Barret was that he had the youngest most innocent spirit she had ever met. He knows no pain, no anger, no sorrow. I have to say this is pretty spot on for my Barret. He is so trustful of almost everyone and just happy all the time. Even at five years old and down to only three legs, he bounces around like a twelve week old pup! He does not have an off-switch. She could tell that I was very attached to him and that his amputation had made us very close. This is totally true, and any other Tripawd mom will agree. There is no bond that can compare. I didn’t have any specific questions for him, so I asked if she could sense anything about my pets at home. Amazingly, without me giving her any additional information she asked if I had a Brown dog only a little bit bigger than Barret. I said yes (Gatsby). 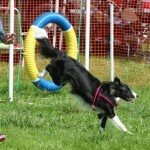 She said that he’s vocal and appears aggressive towards other dogs sometimes. That’s kind-of true. It’s actually more true of Sara, who is also brown and white. I would be curious to know if she had Sara and Gatsby switched around. Everything she said about Gatsby seemed to fit Sara more than Gatsby. 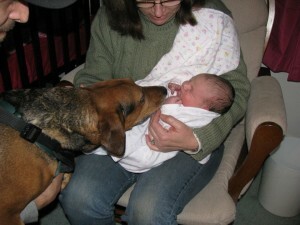 She said that the brown dog was attacked when very young. He acts up to protect himself. It’s possible, He was 16 weeks when he came to our home. 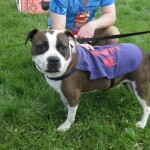 Sara could have been attacked in her previous home with all the other dogs in the home and the poor care she was receiving. 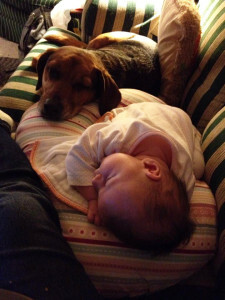 She had some desensitization suggestions for this “Aggressive” dog (who I still think more fits Sara than Gatsby).